Ms. Jo was afraid I wouldn’t be able to stay awake driving because I was taking antihistamine. So when I went to Inverness to speak at their Chamber of Commerce “Person of the Year” banquet recently, she sent granddaughter Emily Ann along to make sure I stayed awake. It really was a delight riding with Emily. When she was just a little child she went with me all over the place doing stories for TV. But then teenage years hit and they get their own lives and you hardly see them again. But we had a couple of hours each way to recall our greatest adventures from her childhood, and also to talk over almost-grown-up stuff she’s going through as a freshman in college. We made it to the banquet early enough so I could visit with folks a bit. Emily got a glass of sweet tea and found our seats at the table. After a while I joined her. When I sat down she pointed to a gentleman across the room and said he had just paid her a compliment. He told her that she was the first teenager he had seen in a long time who politely sat at a table without fiddling with their cell phone. I noticed that she didn’t have her phone out. So I complimented her too on being mature enough to patiently visit with people and not rudely have her head bent over and her thumbs flying across a keyboard flipping from app to app and sending texts to a hundred people. Inverness is planning a couple of Christmas events including “Follow the Star,” which is a walk-through-the-streets live nativity play, on Dec. 1 and 2. It reminds me of the outdoor “Passion Play” that First Methodist of Kosciusko does every Easter in downtown Kosciusko. One item of Chamber of Commerce business discussed before the awarding of the Person of the Year was who, how and when the luminaries would be set out and lit Christmas Eve on the main street and on down to the bayou. It is refreshing to see a community being a community, especially doing fun things during the holidays when life is supposed to be fun anyway. And when it is less than fun, other folks will put out enough decorations to make it colorful, at least. I remember our annual holiday excursions to see the floats on Deer Creek at Leland when I was growing up in Greenville. They are still there every year. And Indianola decorates Indian Bayou downtown, as I recall. Oh, by the way, I met Santa Claus a few weeks ago. It was while we were shooting a “Mississippi Roads” show at the Alice Mosley Folk Art Museum in Bay St. Louis. Bob McGraw walked in wearing a red shirt, longish white hair and a real beard. I immediately scurried over to him and told him I knew who he was and that I had been good. I hope you get to see everybody you want to see over the holidays and your season is full of light. 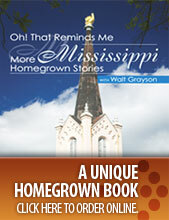 Walt Grayson is the host of “Mississippi Roads” on Mississippi Public Broadcasting television, and the author of two “Looking Around Mississippi” books and “Oh! 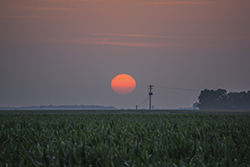 That Reminds Me: More Mississippi Homegrown Stories.” Contact Grayson at walt@waltgrayson.com.